If you want to bring passion into your gift giving, then red is the color choice for you. And these red bags all equipped with handles will make your gift giving extra special this year. Whether you're giving your significant other some great wine with our wine bag, or a great ring with our smallest size, red will surely get their attention and keep it. 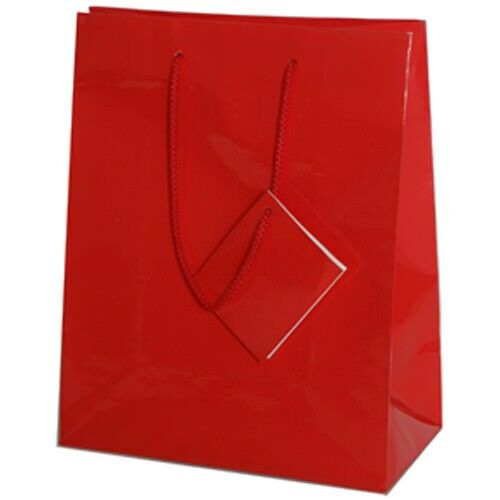 Red Gift Bags are available in more than ten different sizes. Our options range from an extra small sheer bag to a jumbo size polka dot bag! And our styles are to die for. Go for our alligator texture for your mom's birthday (I know mine would love that) or pick our 100% kraft bag for all of those environmental lovers. The red color is great for any kind of year (especially Christmas) and the bag makes for easy packaging. Put some red tissue paper inside and viola! Your bag is good to go!